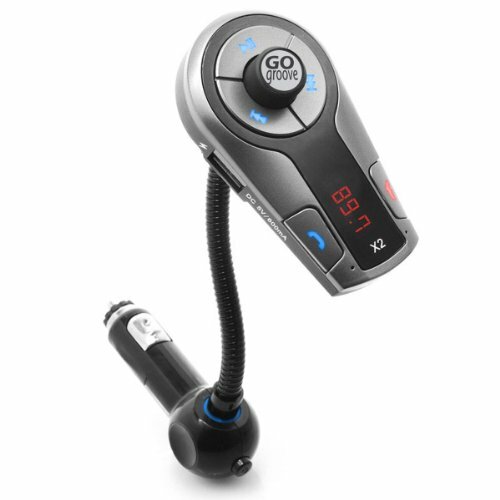 GOgroove FlexSMART X2 Bluetooth In-Car FM Transmitter. Multiple Features - The X2 is proven to be one of the best car kits on the market! Equipped with Bluetooth 2.1 , USB port , FM tuner , Auxiliary-in port and DC surge protection , it’s ready for anything. Plug in , setup and pair to the X2 in seconds. An LED display hub lets you control your music and take calls with ease. Multipoint Bluetooth Connectivity allows you to pair 2 devices at once so you can take calls and stream audio from either. Innovative Design - Tuning into your music is a snap. Just sync the X2 to your BT device and enjoy the wireless experience. The hands-free tech in the X2 allows the user to make and receive calls while driving. If music is playing , it will fade out to connect to a call. The X2 also has a built-in microphone with voice detection , so every conversation comes out clear. Use the USB port to charge your device so you always have power. Built to Adapt - The X2 plugs into and grips your DC outlet with a secure fit. The flex neck is tough but allows you to get the perfect angle no matter what setup you have. And for your non-Bluetooth devices , use any 3.5 Aux. cable to plug into the Line-In port of the X2 , then transmit your music without worrying about adapters. Works With:. Apple iPhone 6s , 6s Plus 6 , 6 Plus , 5s , 5c , 5 , 4s , 4 / iPad Pro , mini 4 , 3 , 2 , Air 2 - Samsung Galaxy S6 , S6 Edge , Note 5 , 4 , Note Edge , S5 , Alpha , Star 2 , S5 Sport , S4 , S3 / Galaxy Tab S2 , 4 , S , 3 - Motorola Droid Turbo , Moto X , E , G - HTC One M9+ , M9 , M8s , M8 , E8 , Max , One , Desire 820 / Volantis - LG G4c , G4 , G3 , G Flex 2 , G3 Stylus , G Flex , Nexus 5 , 4 - Sony Xperia Z3v , Z3+ , Z3 , E3 , C3 , Z2a / Tablet Z4 , Z3 - ASUS MeMO Pad , Google Nexus , Transformer Pad - HP Stream. And More! MULTIPOINT BLUEOOTH CONNECTIVITY pairs 2 devices simultaneously so you can take calls & stream audio from either! Trade off DJ'ing and have both your personal & business phones synced! BUILT-IN MICROPHONE with enhanced voice detection makes hands-free calls easy - plug-in, sync your phone, and you're ready to talk!